Multiple conifgurations available! Call us for more info. 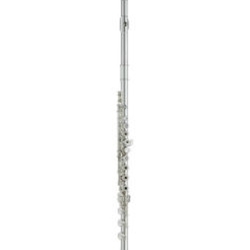 Yamaha Professional Flute Model 677HCT sterling silver handcut headjoint, sterling silver body with silver-plated mechanism, pinned mechanism, drawn tone holes, French (open hole) model, pointed key arms, gold springs, (.018 standard) tubing, A=442, Straubinger Phoenix pads.. Handmade in Japan.